Millions of Americans are bitten by dogs every year leaving many with serious scars, injuries, and occasionally even requiring hospitalization. 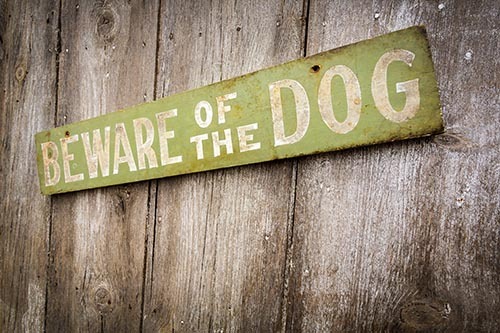 If you or someone in your family is ever on the receiving end of a dog bite, there are a few things you should keep in mind since it is sure to be a difficult and emotionally challenging time for you and your family. First, in New Jersey, you have two years from the date of a dog bite to file a claim in court. However, this time limit can sometimes vary and in some circumstances, could require filing some claims in as short as ninety (90) days. Therefore, it is important that you contact a personal injury attorney familiar with these cases as quickly as possible. Second, New Jersey has a strict liability statute for dog bite injuries. This means that if a person is bitten by a dog, he or she does not have to prove the dog’s owner was negligent or careless. In order to prove that the dog owner was liable, the victim needs only to demonstrate that the bite happened and an injury occurred. This is true regardless of whether a person was bit in a private location, a public place or whether or not the dog owner has any knowledge that the dog is vicious or not. If you have been a victim of a dog bite it is important to speak with an experienced personal injury attorney who can help you decipher the laws that govern dog bite injuries in New Jersey.